It was an amazing summer in Ketchum, ID, neighboring states, and even countries. I had intended to write in my blog at least every week, yet once we were into the summer I felt that we needed to be outside every moment. Sitting at my computer just didn’t happen as planned. One of my other goals (that I actually did accomplish) this summer was to put my hands into a river almost everyday.There is something about actually touching nature that can transform your day, your mood and your outlook on life. There are three rivers within 5 miles of our house, as well as endless hiking trails, bike paths and outdoor opportunities. Immersing yourself in nature is not something you have to plan or think about here, you just walk out the front door. To just walk outside and really be in nature is what I miss so much when we are in Washington. Sure, you walk out the front door and you are certainly immersed in nature in the form of rain drops but it is the appreciation and enjoyment of being outside that makes the experience in the mountains so different. I don’t know how many days, weeks or even months would go by where I did go outside (to and from the car) but without gratitude in my heart. And, in fact, I had the opposite of gratitude in my mind. That seems so sad now. I find myself craving nature, craving the touch of nature. I go hiking in these beautiful mountains and my brain is on full power. The cool rivers, smells of wild sage and the warm sunshine has me so inspired to make a difference in the world, to make a difference for my family and for myself. I have been changed by these mountains in such a short time. As children, both of us grew up in households where time spent in nature was encouraged, and our current memories tell us that such times in the great outdoors were filled with curiosity, fascination, and discovery, as well as with calm, joy, and happiness. The fragrance of pine and flowers; the sounds of rushing creeks, waterfalls, and ocean waves breaking; and the sights of fireflies and other interesting animals captured our minds. As time passed, our responsibilities and adulthood pursuits left less time for nature immersion. The recognition and instant recall of nature’s benefits would be obscured by our own efforts to advance in a technologically driven world. Our individual stressors, personal anxieties, and the overwhelming demands of contemporary life would ultimately bring us back to the medicinal aspects of nature, to our current investigation of the scientific validity of those childhood memories. I have been reminded of how much I need to be outside, to touch nature, to appreciate and have gratitude for time spent in our beautiful world. When we return to Washington, my renewed love of the outdoors will help me to be purposeful everyday. There are many opportunities there as well but it is just not calling your name everyday like it is when the mountains are right there and the sun is shining brightly. Going outside and Being in nature is a very important part of who I am and so I will figure it out no matter where I live. I am so thankful for the opportunity to be reminded of this love. Nature is a very important part of all of us – literally part of our DNA. How do you satisfy your craving to be outside – no matter where you live? Our year in the town of Ketchum, ID has begun. We survived the drive, unpacked and found places for just about everything. It really is amazing to me how little we really need for a year of living. So many things are collected and so little is useful on a daily basis. Our clothes, computers, bikes, the Wii, lots of books for me and the girls, American Girl dolls, yoga mats, Bob’s fly fishing and hunting stuff, camera equipment, camping equipment and about a dozen stuffies. That is what we have deemed important for the year although most would not be called ‘essential’. How is that we still have full cupboards at home? So far I can’t think of one thing that we forgot and cannot do without. Starting the year off a little lighter feels really great. 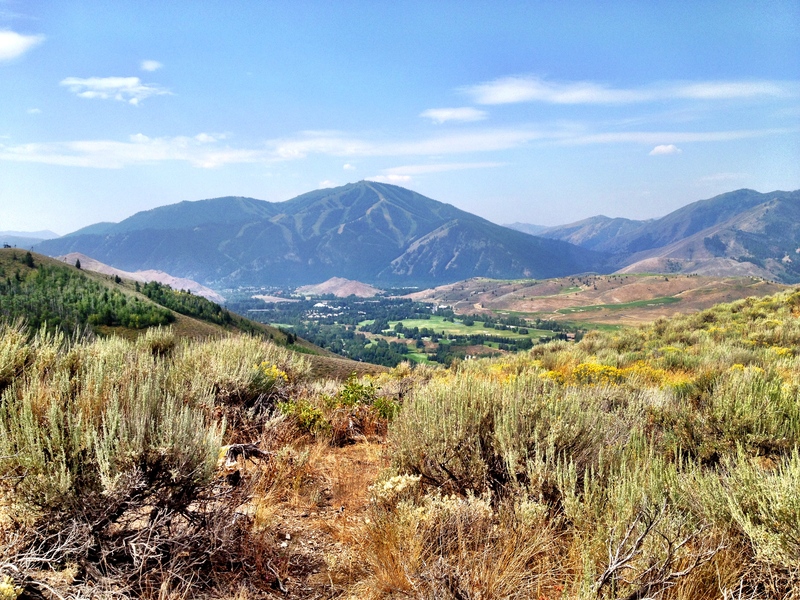 This will be our 8th year coming to Sun Valley so we have bypassed the idea of being completely new to the area. When trail running the other day, I was asked by two different groups how to get somewhere and I actually knew what I was talking about. Feeling like a local already. The girls have jumped right in with a marathon play date with the girl next door — 9:30 am to 7:30 pm. 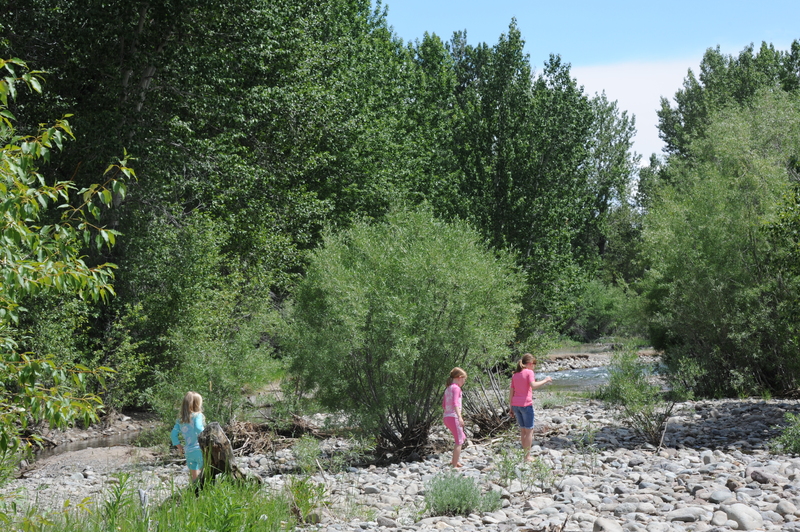 We have been to Warm Springs Creek, The Big Wood River and Trail Creek in the three days we have been here. “It isn’t summer until we are in Sun Valley,” says my oldest daughter. I think that is true. Let’s see, what shall we do today? Can a Place Change Us?